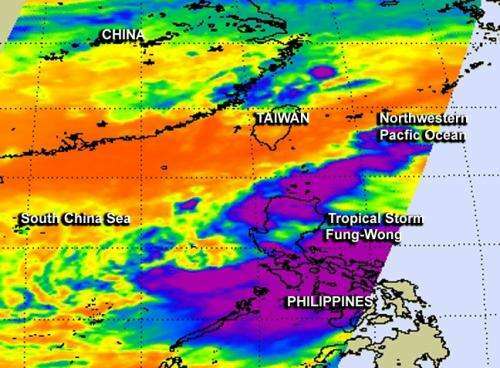 Tropical Storm Fung-Wong continued to affect the Philippines while moving north through the Northwestern Pacific Ocean. NASA's Aqua satellite provided infrared data on the storm's clouds that showed some high, strong thunderstorms with the potential for heavy rainfall over the northern and central regions of the country. The storm is now expected to affect three more countries over the next several days. The AIRS instrument aboard NASA's Aqua satellite uses infrared light to read cloud top temperatures in tropical cyclones. When Aqua passed over Fung-Wong infrared data saw some very cold cloud top temperatures and strong storms. Those storms had cloud top temperatures near -63F/-53C indicating they were high into the troposphere and had the potential to generate heavy rain. On Sept. 19 at 0900 UTC (5 a.m. EDT) Fung-Wong had maximum sustained winds near 40 knots (46 mph/74 kph). It was centered near 18.9 north latitude and 121.0 east longitude, about 247 nautical miles north of Manila, Philippines. Fung-Wong was moving to the west-northwest at 13 knots (15 mph/24 kph). Now that Fung-Wong is departing the Philippines, it is now forecast to affect Taiwan, China and Japan. The Joint Typhoon Warning Center now forecasts the center of Fung-Wong to track through Taiwan from south to north over Sept. 20 and 21 and make another landfall near Shanghai, China on Sept. 23 before curving back over the ocean and head toward southern Japan.